Component video - three color-coded, high-resolution cables conveniently wrapped in one X-traflex jacket allows quick and easy connections. 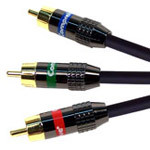 All three cables are 100% shielded for maximum resolution and picture quality and feature premium 24K gold RCA connectors. Perfect for home theater applications! We have no downloads available for the Comprehensive Video Professional Grade Component Video Cable 50 ft at this time.